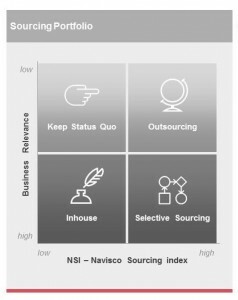 The Navisco Sourcing Strategy defines the strategic cornerstones for any outsourcing initiative. Nine aspects cover all relevant and necessary dimensions of our Sourcing Strategy. Cornerstones are a profound analysis of commodity services versus core competencies and a detailed savings and risk analysis. For the make-or-buy decision Navisco provides a market-proven service model for commodity services with corresponding market prices in all areas from IT infrastructure, application to business services.